Most people who buy our plastic drums usually use the drums to contain food, oil, chemicals and acidic products. The poly drums hold up well to these liquid products and last for a long time. Plus, we can easily clean and repurpose the plastic drums for a different product or recycle the drum once you finish with it. Increasingly though, people have found a new use for these plastic drums. They turn plastic drums into rain barrels for their homes and gardens. Rain barrels collect, or harvest, the rain as it falls and runs through your home’s gutters and drain pipes. 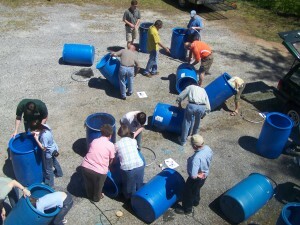 Turning plastic drums into rain barrels have several benefits for the environment. Today, we’ll explore those benefits and how you can outfit a recycled plastic drum into a usable rain barrel for your home and garden. Rain barrels have several benefits. First, you capture a precious resource — water — to use in your garden during months when the rain isn’t falling. This reduces your need to tap into a city’s water supply saving you money and leaving more water for other uses. You also help protect your local waterways by reducing storm water runoff from your home. Rather than rainwater rushing down a downspout or your driveway into the storm water system — and then right into the local waterways — you capture the rain and return it to the earth, where it’s absorbed into the water table. Rain barrels can last through decades of rainy seasons in your garden. The poly material is manufactured to withstand chemicals and other acidic materials and so will stand up well to rain, dirt and winter weather. Turning a used plastic drums into rain barrels requires very little effort. First, you should make sure whoever you buy a used drum from has properly purged and cleaned the drum of its prior contents. A rain barrel won’t serve you, your plants or the environment if it still contains hazardous materials. Also, with this process these types of barrels should never be used for drinking water. Secondly, you will want to make sure it has a secure, childproof lid to prevent any accidents. Lids will also prevent wildlife from getting in to the barrel and mosquitos, who love to breed in standing water. Under the lid and with a little room to spare, install a piece of screen to catch debris as it flows out of the eaves-trough downspout. Debris in your rain barrel can clog the faucet or spout, making it difficult to use the water inside. Choose a rain barrel with a hole in the lid that fits your downspout or cut a hole the appropriate size. Install an overflow attachment and hose near the top of the barrel as well. During the rainy season, the barrels fill quickly. You will also need a faucet or spigot at the bottom of the barrel. Use a rubber washer next to the barrel, both inside and out, and a metal washer against the faucet on the exterior and the nut on the interior. The washers will help to keep the faucet water- tight. Finally, position the barrel under the downspout on a platform. Cinderblocks work well for this purpose. You want to leave enough room to fit a bucket or watering can under the faucet. Great Western Containers believes in “cradle to the grave” service for our products and in disposing of containers in a way that serves the environment. Turning plastic drums into rain barrels meets these goals and extends the life of these indispensable drums. CAUTION: Used plastic drums should NEVER be used to capture drinking water! Thank you for the feedback and input.